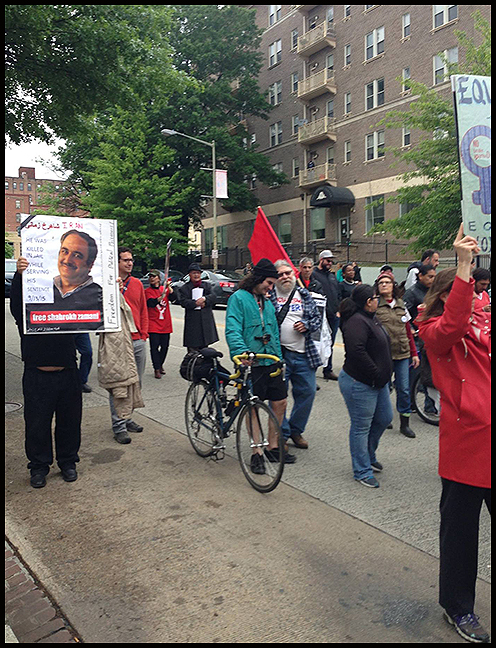 On May 1st, 2016, we gathered with other activists in Malcolm X Park, in Washington DC, to stand in solidarity with workers in Iran and worldwide. After statements were given in the park, we marched through the city. In Iran there is a 99% just like America’s 99%: a few people are very wealthy, but most people are just getting by. In Iran, 70% of people are surviving under the poverty line. In both countries, the severe inequality is due to a corrupt system designed to enrich the wealthy on the backs of working people. Here in America people are protesting undemocratic elections, with over 1000 arrested last month during the Democracy Spring action here in Washington DC. In Iran in 2009, millions of people filled the streets also protesting against undemocratic elections. Many were arrested there too; they were jailed under brutal conditions, tortured and killed. In both countries, these conditions are the result of a corrupt system designed to keep governance out of the hands of the people. In Iran, police roam the streets looking for a certain type of person to crack down on if they have even a wisp of hair or an inch of clothing out of place. In America, the targets of this kind of policing are blacks and Latinos; in Iran, the targets are women. It is done to divide people against each other. Yet in both countries we fight back, from the Black Lives Matter movement in America, to the campaign in Iran for women to throw off their scarves, risking jail or worse. These conditions all have the same root cause: an economic system that requires racism, sexism, classism, and disenfranchisement to keep the wealthy in power and the workers on their knees. But in Iran, as in America, workers are standing up to demand equality. Like the Fight for $15 movement here, workers in Iran are striking nearly every day to demand back wages, fair wages, the benefits that they have earned, and safe and dignified working conditions. From the teacher’s unions, to nurses’ and miners’ unions, workers in Iran fight every day for their fundamental rights. And as a result, their leaders are thrown in prison, tortured, and killed. Jafar Azimzadeh (Monir): My name Jafar Azimzadeh, the President of the Free Union of Workers of Iran. I am in jail, sentenced to 6 years in prison for standing up for workers’ rights. I am also banned from joining political parties and from publishing my writing online. Esmail Abdi (Latifeh): My name is Esmail Abdi, a leader of the Iranian Teachers’ Union. I helped to lead nationwide rallies to protest the low wages that leave most teachers below the poverty line. As a result of my activism, I was sentenced to six years in prison. Saeed Shirzad (Faromarz): I am Saeed Shirzad, a worker and child rights activist. I was arrested at my workplace and sentenced to 5 years in jail for being an activist. They put me in solitary confinement where they torture me and threaten me with execution every day. Amir Amirgholi (Leila): I am Amir Amirgholi. Because I am a political activist and I fight to stop child labor, I was sentenced to 21 years in jail. The conditions I face in prison are so terrible that I am now on a dry hunger strike. Behnam Ebrahimzadeh (Soudabeh): My name is Behnam Ebrahimzadeh. I am a child rights and labor rights activist, and a political prisoner in Iran. Because I refuse to stop my activism even while in jail, I have been subjected to physical and psychological torture, brutal beatings by prison guards, solitary confinement, denial of medical care, and denial of visits with my teenage son, who is sick with cancer. Working people in Iran ask for your solidarity as we make our demands for equality, and for a just and humane society for every person on earth.